This is the third episode in Molly and Sara’s new podcast series Living Fearlessly. In each episode, they will dive deeper into the things that we can all do to live fearlessly for ourselves and our soul growth. 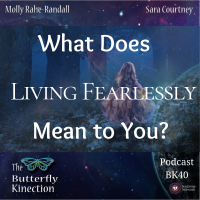 This week, Molly and Sara pose the question: What Does Living Fearlessly Mean to You? They talk about what this series of podcasts is about. By releasing things, accepting things, being motivated, etc. we are more able to get to a point that we can start living fearlessly. 4:47- Sara discusses her fear of thinking about this and shares what living fearlessly means to her. 6:35- Molly shares what living fearlessly means to her. Sara talks about purpose and leading by example. We can’t teach by example unless we are leading by example. Then we can help others to find what resonates. Molly talks about the greater thing and purpose she is supposed to be doing. She talks about her fear. We all have something to say. Our life stories are the things that we go through in life. We go through them not only so we can grow, but so that we can support others along their journey. In order to truly live fearlessly, we have to be willing to open up, let go of potential judgment and forgive ourselves. Sign up for our Free Soul Reflection Challenge! You can download our meditation Inner Strength Meditation on our website! Our podcast listeners can use the coupon code PODCAST to receive a discount! For more of The Butterfly Kinection, follow us on Facebook, Instagram, Pinterest, and our website. To receive information on special offers, new products, upcoming podcasts, new classes, or our newsletter, subscribe to our email list HERE!